A new chapter, we're moving to a new country! After 5 wonderful years spent in Amsterdam we will leave for new adventures in the neighbouring country, Germany! It is every time unplanned and fast moving but it seems like every 5 years we are going through big changes in our life! It is a bittersweet news as we are so happy as a family in the Netherlands but at the end of August we will be leaving our beloved Amsterdam for new adventures in Bonn, near Cologne. More on this new chapter in September once we have settled in our new home. In the meantime if you have any recommandations on Cologne and Bonn i'd love to hear from you as this is all very new to us! The Siberian freezing wave is now over and the temperatures are rising fast. It was -5 degrees two days ago and 13 degrees today in Amsterdam! I have to say I liked it when it was freezing cold as we had the most beautiful blue sky and the sun shinning every day which is rate at the time of year here. On Saturday Simon and I had a date night. It was too cold to cycle so instead we walked to the canal rings. They were all frozen with people ice skating reminded me of a famous painting by Dutch artist Hendrick Avercamp. It was so magical...but didn't last very long. Last Sunday we all woke up early and drove half an hour out of Amsterdam to Wassenaar to visit the newly built Voorlinden Museum. Upon our arrival kids were playing ice hockey on the frozen lake. It was a very cold yet beautiful sunny morning. Voorlinden Museum is a private museum of contemporary and modern art. The art collection is owned by the Dutch industrialist Joop van Caldenborgh and it is one of the largest private art collection in the Netherlands. The museum opened its doors only few months ago, on September 2016. The museum building was designed by Dutch architect Dirk Jan Postel. I love the huge floor to ceiling glass windows overlooking the fields and garden designed by the renown Dutch landscape designer Piet Oudolf. The design of the museum was inspired by that of the Danish Louisiana Museum of Modern Art and the Swiss Fondation Beyeler. The vast art collection of Joop van Caldenborgh known as the Caldic Collection was built over 40 years. The collection on display consists of a permanent collection with impressive sculptures by Richard Serra, Roni Horn, Ron Mueck, James Turrell and the walk in Swimming Pool by Leandro Erlich. This was a big hit for the children. Also walking inside the Open Ended large scale sculpture by Richard Serra was an incredible experience. Ron Mueck, Couple under an umbrella. Also on display from the permanent Caldic collection was Full Moon, an introduction to little more than 40 artworks from various periods, movements and styles. Tom Friedman, Untitled (Apples) 2012. The other part of the building is a temporary exhibition by Martin Creed SAY CHEESE. As you enter the museum the first room you see is filled with blow up balloons. Our little Téo who LOVES playing with balloons of all sorts was over excited to 'swim' in this sea of blue balloons! Oh and we ended up our visit with a delicious and typical Dutch lunch with cheeses and charcuterie! I'm so happy it is the weekend! The week has been super busy so apologies for the late post about our really nice day at Snor Festival last Sunday. My mum was visiting us in Amsterdam for the weekend so I was very happy to show her this lovely Dutch creative yearly festival. This time the Dutch publisher Snor took over a large industrial space in a residential neighbourhood of Utrecht. Large colourful boxes and green houses were nicely set in this rough space. Many workshops were taking place such as this tote bag customisation (Ophelia was delighted) and another one for paper lovers with Flow Magazine. This space will keep on living during the months to come with regular events and workshops. I am delighted to announce the launch of our latest map of Amsterdam! I had great pleasure drawing and cutting this map as I am so in love with this beautiful city that we now call home. I have featured my favourite spots like the Albert Cuyp market in the Pijp near where we live and where you can find typical Dutch treats like raw herrings! Also the Artis zoo and the Vondelpark where I love to go with the kids. The map celebrate Amsterdam famous for its artistic heritage, elaborate canal system and narrow houses with gabled facades. There are more than 400km of cycle paths in Amsterdam so you may spot one or two cyclists! 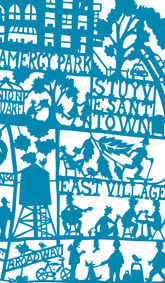 Available as both a laser cut map and a hand screen print. Paper cut available in 2 colours: black, and deep blue. 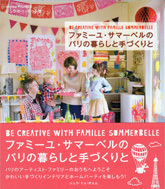 Would you like to join La Famille Summerbelle? Our last removal box has been unpacked today. I guess we were close to 100 of them, far too many. Now we need to find a place for everything but most importantly de-clutter as much as possible. Thing we didn't manage to do before we moved house! This is Téo sitting at the dining table in our new kitchen. We merged a small study room and the previous kitchen together to make a large and well lit open plan kitchen. We have 3 large windows facing South so when the sun is shinning it's such a bliss here. Sunday morning visit to the CoBrA Museum in Amstelveen with the children. The museum has a really nice kids workshop where they can paint and draw after looking at the work of Joan Mirò. Ophelia and Lucien got given a sketchbook and pencils upon arrival to draw their favourite work of art in the museum. Really fun morning! What a blissful day in Amsterdam. Not a single cloud! ...Ophelia and Lucien are off school so we decided to visit The Oasis of Matisse exhibition at the Stedelijk museum. It is only a short bike ride from our home, so they took their pencils and notebooks and off we went. It is the largest ever retrospective of work by Matisse to be shown in the Netherlands. The ground floor rooms features paintings, drawings and sculptures by Matisse alongside works by Cézanne, Van Gogh, Picasso and others. The top floor focuses on Matisse's monumental cutouts. The children loved this part best, I guess due to the strong colours and bold shapes that they can relate to. Families with children can go in the Stedelijk's Family Lab where round tables with lots of colourful papers and scissors are displayed. Ophelia and Lucien were very excited to create cut-outs like Matisse and pin them on the wall! Detail of Matisse Jazz book. Leaving the exhibition, we walk pass the Rijskmuseum and loved the stunning clouds over our heads! The Friends Book is here! I am very happy to finally announce the launch the Friends Book, Vrienden Boek in Dutch. It’s been such a pleasure to collaborate on this book with my friend Esther from Babyccino Kids and the wonderful Snor publisher. We started to work on this project back in September so I can tell you it is really nice to finally hold a copy in my hand and show you some images. I was very excited when Esther ask me to work with her to design all the illustrations of the book, I mean how fantastic is to work with a friend on such a lovely project. This is a book for your children to share with their friends. It’s about who they are today, about their family and friends and what they would like to become one day. They are really sweet and fun questions such as ‘what is the best thing you and I have done together’ and there are spaces to draw ‘your dream house’ or even ‘I made this for you’. There is a double page for the owner of the book and for each friend to fill in and lots of funky stickers to spice up the pages. As you can see the book is written in Dutch, so this is for you my Dutch friends readers! We’re hoping to launch an English version of the book soon for the non Dutch readers like me! If you are in Amsterdam this Sunday 19th April, come over in De Pijp to the new kids concept store De Kleine Parade for the launch party of the Vrienden Boek. An old VW van will be parked outside the shop with a photo booth inside so the children can have their passport photo taken to stick in the book! I hope to meet you there on Sunday! You can also buy a copy of the book here. Work in progress...map of Amsterdam! I wanted to show you some images of my creative process for designing the paper cut map of Amsterdam, our current home town - we moved to this beautiful city more than a year ago! I am very excited to design this map of Amsterdam. This City has so much character. The architecture is stunning, the canals, the boats, the variety of bikes are so much fun to draw and to cut! I usually start a map by doing a lot of visual research of the different part of the City: listing and sketching the tourist attractions, museums, parcs, streets, canals, and all the important landmarks. I usually go out and takes photographs or take my notebook with me and do some sketches outside. I also use Google map and gather images online. I usually fill in a large notebook with random sketches. Only when I have gathered enough information and filled in a full sketchbook, I can start to draw the map on a large sheet of thin paper. When drawing the map I have to make sure that all the lines interact with each other as the map will be cut out of a single sheet of paper. The Dutch Design Week in Eindhoven is one of the biggest event happening in October in the Netherlands and it is really worth going (18-26 Oct). The quality of work from Dutch designers is outstanding and so inspiring. The event is taking over the entire town of Eindhoven, offering numerous exhibitions, seminars, workshops, parties, food and drinks. Altogether there are more than 300 events at 80 different venues! My sister Charlotte is graduating in December from the prestigious Design Academy. She invited my family over to spend the weekend in Eindhoven to show us the different events and to visit the graduation show at her school. We had such an amazing time, thanks also to the most beautiful weather. It felt like Spring time! We Make Carpets by Dutch trio Bob, Marcia and Stijn. Not the kind of carpet you would expect. You cannot walk on them. From a distance they may look like a carpet but come closer to discover a carpet made of pasta, colourful sponges, beer bottles, fire crackers, pegs, wooden sticks or some other everyday product. Graduation project from the Design Academy by Debby Yu. Lunch on the sunny terrasse in the Strijp Area. There is a huge skate park right next door. We also went for a coffee at Pastry Club located in a reconverted factory. On Sunday after a long breakfast sitting outside in the sun, we all went to visit the Piet Hein Eek factory where he reconverted an old Philips building into his workshop, showroom, shop, restaurant and studios for up and coming Dutch designers. It is such a wonderful and inspiring place to visit. Ceramics rENs, exploring the colour red on different ceramic objects. Ceiling lampshades by Lotty Lindeman and Wouter Scheublin. Sunday on the beach, 30 minutes drive from Amsterdam. No wind, delightful temperature, lunch in the sun and a long walk on the beach. More Sundays like this please. This morning I went to visit Woonbeurs, the Dutch Interior trade show in Amsterdam. I went along with my friends Ester Van der Paal from Babyccino and Erika Harberts from Miko Design. Erika is famous for her beautiful Paris Dolls and for making the most adorable and imaginative breakfast and afternoon tea for her daughters. I have known Erika for a while but only through her work and social media so it was nice to meet her 'for real'! It was my first experience of an interior trade show in the Netherlands and it was a nice one. It was a good size show, not as huge as Maison et Objet so I managed to see quite a lot within my tight schedule of 1h30. Here is my selection of things I liked. I took the photos with my phone so excuse the poor quality of the snapshots. Creative desk on the 101 Voonideeen stand. I love the customisation of tins and shoe boxes.